I enjoy being in the mountains! JMT 2018 Bound! Lots of trips to come for training! I was really excited to head out to this campground/ site because it was a close drive from my home, but far enough away to get up in the mountains. My sister, her 3 kids, and 2 dogs jumped into the car and headed out towards Idyllwild, CA. Though this is techincally condisdered Pine Cove, CA, it is only about a 10 min drive away from the adorable town of Idyllwild! The campsite had room for 1 car, and was allotted 8 people. A long picnic table and a campfire ring with a grill opition! We set up a hammock in the front, a slack line on the side, and a dog run behind our campsite! We took the kids on the nature walk and they loved it! Big brother read the signs about the pine cones to his little sisters! We went into town as well and bought a big bundle of local fire wood at Mountain Mike's off Cicle Dr. for only $10. ( The best firewood ever ) We mostly just hung out at the campsite for the kids to run around and be kids! They made some friends with some neighbor campers, so all 5 kids ran around having the time of their lives! If you find yourself in the Crabtree Meadow area due to section hiking, or maybe summiting the ever famous Mt. Whitney, this is the campground I suggest you stay at! Guitar Lake is a beautiful spot to stay at no matter which spot you pick! Since this is bac country, you really get to pick any spot you see suitable as long as it follows guidelines of 100ft from the trail, 100ft from the water sources and do not set up on the vegetation. It's pretty easy to spot the "normal" spots people stay in. Just walk around a little, you'll find plenty. We choose to stay on the North side of the lake as we were hiking up from Crabtree Ranger Station / Meadow area. This would make for the best summit the next day of Mt. Whitney. There are no trees in the area as this is above tree line. We were within guidelines, but the water was not a far walk. Plenty of fish swam along the stream that connects to the lake. The water was COLD, but else would you expect for a lake that high up (11,460'). There are marmots, chipmunks, and mice that inhabit this area so make sure all your food is stored per regulation in an approved bear canister! Bonus: Before the sunrises, you can see the headlamps of other hikers making their way up the switch backs! As a Ranger for The Dyrt, I get products to test from time to time - today I am testing the Body Glove Equalizer Sport Bra in the color Agave- size S. I want to begin with saying that this sports bra blew my expectation out of the water! Being an active woman I have purchased many different brands from many different stores over the years. Some were better than others and most would suffice. This sports bra couldn’t have come my way at a better time for I was about to go on a 3 week backpacking trip through the Sierra Nevada. I chose for the Body Glove Equalizer Sports Bra to be the ONLY bra I’d be carrying with me to take it on the ultimate test. Normally I would break down reviews into pros and cons, but in my opinion, this bra didn’t reveal any down sides! Quality: This bra was made with a blend of nylon and spandex. It also had two removal cups, to which I decided to remove. It did not change the support in an way. It has a netting type mesh in the razor back that also lines the inside of the front. I did not experience any loose stitching. While taking on and off I never heard a 'rip' sound that most sports bras make. The sound of money down the drain as your stitching just ripped. Though I wore this bra for 20 straight days, never once did it make that 'rip' sound. Another quality feature I was impressed with was the fact that I didn't have a single rubbed-raw spot like all the other sports bra's I own. Typically after wearing my normal sports bras all day, I'd end up with a raw, red spot on my rib-cage. With the Equalizer and after long hours, sleeping in it, and wearing it into the next day, and the next day for that matter.. I didn't have a single sensitive spot from it! Lets just say on a 3 week backpacking trip, you are extra thankful for that! Sizing: I am typically a 32B in a normal bra size and I choose a small based off their sizing charts. I was a little nervous to go through with purchasing a small because I normally wear a medium on my top half. Thankfully though Body Gloves sizing charts are spot on! A medium would have been too big! The small was perfect, not tight to leave marks, but taught to be supportive. Washing: Being on the trail for weeks you have to wash and wear your items. Like I said above, this was the only bra I brought with me. I was so thankfully for the nylon/spandex blend for being a quick dry material! Mind you I washed the bra only about 3 times in the 20 days so I was impressed when even after the long days of hiking 12-15 miles, this bra never gave off any sort of smell. It never itched. It never became uncomfortable. Summary: This is the best sports bra I have ever had the privilege of wearing! I recommend it 10/10. Baker Creek Campground at first glance was a small campground when just booking it online. Not too many photos or information about it other than bathroom, trash cans, fire rings etc. We showed up around 6 A.M. when it was still dark in the campground. I knew the general area of the campsite, so we drove around with only head lights to guide us. We ended up essentially drive through campsite 33 I believe it was, to get to our campsite 34. So that particular step up was a little different. We we stepped out of the car we could hear a stream on both sides of us, ahhhh we made it. The sound of the stream was lovely. We set up camp and knocked out for a few hours. Waking up in the sunlight was an experience because it was pitch black when we showed up; past our two stream, we hadn't known what was surrounding us. Upon waking up we could see there was a trash can and restroom not too far away. On our West side past the creek was a small hill. To the east on the other side of the stream there was two other campsite. There was rocks in the stream so you could cross with ease. It also helped with the serenity of the stream sound. We went hiking to Big Pine lakes that day. When we returned 5.5 hours later, everything was as we left it, but we had gained some neighbors. It was a little weird that we now had to drive through an occupied campsite to get through to ours, but there was plenty of space to do so. Also, across the stream we gain a gentleman and his dog. This site was a little overgrown and the whole campground itself was a little malnourished. Before leaving the following day we drove through the entire campground to find it was much bigger than we anticipated. There were ponds for fishing and the stream ran through the entire campground. There were spots for RVs. Car/ tent. There was a option for tent/walk-up too. Seems like a pretty popular campground despite its appearance. Overall we would love to camp there again! As a Ranger for The Dyrt, I get products to test from time to time - today I am testing TredAgain's Sandals! These TredAgain Sandals were one's I have been looking forward to reviewing. This is the first time they have come camping with me, but I've been using them daily. First of all, I would like to say that while shopping for them that I really enjoyed they had a selection of colors to choose from, but I am a simple gal so black was the way to go. Second of all, I respect and love what TredAgain is doing as a company for the Earth as a shoe-wear company. Recycling, or as they call it up-cycling , old tires into durable footwear! It speaks to my love for the environment! Though it was chilly outside this weekend I still rocked my TredAgain's around camp with my stylish sock! They were perfect to walk across the rocks to get the restroom. Since the sandal is the rubber material, I didn't have a doubt skipping across the rocks! Sitting by the fire, they never over heated like some shoes will so that was enjoyable to get the heat from the fire and not have to worry about my sandals. I know I will be taking these sandals on more adventures with me in the future! They make more than just sandals. This campground is located just around the corner from the permit required sign. There is a lovely creek that lead to a waterfall that some repel down. The campground is up the right of the trail. Nice dirt flat spots within the trees, looking down at the trail. This is a good base camp for the summit. You are a good distance from the trail so it doesn't seem to be a bother as far as noise. If you hike down to the creek and head South, that is where you will find the end of the waterfall. Becaful here though for I have seen a rattle snake not to far from the camp! The sound of the water is the best part of this campground in my eyes. As well as it is a great place to stay as a overnight to break up a summit trip. The spots at this site are far and wide it seems. There is one really good site mostly dirt, no rocks, defined well, but it is right off the trail. So I'm sure you can guess there is no privacy nor silence. This campground is one of the most popular out of the 4 on this trail! You have to get your permit early in the summer season because of that! There are more sites as you hike back, but it seems to be more rocky the further back you go. This has a creek right next to it so that part is wonderful! This camp is just as it states. Summit camp. The summit of San Gorgonio! The tallest mountain in Southern California. This camp is very minimal; it sits just under 11,501 ft. These are not your typical campsite either. Each "site" is a little rock "hotel" to act as a barrier between you and the wind that is blowing more times than not, up to 40+ mph. In the center of each hotel is mostly just a sandy dirt which was nice. Only needed to moved maybe 2 little rocks before setting up the tent. It was nice to not have to worry about it since the tent I own does not have tarped bottom, and someone… me… forgot the footprint for it. So I wasn't worried in the slightly setting up my tent, where as normally I would have scoured the ground before setting it up. There are 4 sites to the North side of the summit. This is where we choose to stayed because we made friends with two groups that were camping at the summit as well. These 4 sites over look Joshua Tree, Crestline area, and Big Bear Lake. To the East of the summit about 75 feet there are about 4 more rock hotels. The view on these are spectacular! You can see Joshua Tree, San Jacinto Mountain, Palm Springs, Moreno Valley/Perris, Rancho Cucamonga, and further on a clear day. ( Side Note: Southern California has had a lot of fires recently, so visibility was not the best. But it is said, on a very clear day from the summit, you can see Mt. Whitney! Best believe I was still looking when I was there too! ). We were lucky enough to have a beautiful, clear, not-windy night and morning. Just out of my tent I could see the sun rising. We made our way completely out of the tent to just sit in silence and enjoy the breath taking sunrise! I give this campground a 5 out of 5 stars due to views and how well the rock hotels have formed over the year and didn't need any upkeep to keep us comfortable! Please note the last water source is about 3-4 miles below at High Creek Campground. Water does need to be filtered! We used this on Vivian Creek Trail up to the summit of San Gorgonio. While hiking up 5,840 ft in just under 9 miles ending at 11,501 ft we used Boost Oxygen to help fuel us up the steep terrain and get us to the top of San G! We tested on this trip the Tasteless Oxygen 22 oz. can. Cutting my breaks by more than half. There are more than few steep sections of this hike that are difficult for even the most seasoned hiker out there. While hiking up these steep trails would get winded, per usual, we stop to take a break (a normal break for us would late 2-5 minutes in order to catch our breath and let our muscles take a break). This time around we would pull out our Boost Oxygen and inhale 2-3 slow deep breaths.With in seconds we would feel rejuvenated. Our breathing was back to normal and with our bodies getting almost straight oxygen it felt like it went straight to our muscles, they would instantly feel revived and ready to keep trekking up the mountain. That would allow us to be on our way in just under 45 seconds of stopping! When on a long trail that you have a time limit, it was extraordinary to know that we were making even better timing than normal by cutting our break by more than half by just using Boost. How much is really in the 22 oz can? Well we put this to the test. Climbing to the summit, my boyfriend and myself ( to which I have referred to as we ), we did not skimp on using the oxygen because we really wanted to know how much could be contained in the can that weighed almost nothing. The answer to that; more than enough!We did try out Boost Oxygen twice so far and both trips we each shared one can for the whole trip and there was still oxygen left in each can. What I noticed and thought was an added bonus was when it did start getting lower there was a small change in pressure of what would come out when you would squeeze the trigger. However, after you notice that pressure change, there was still enough for 20+ breaths before it was completely out. I have also tested the Peppermint tasting 22 oz. can on this same trail. I very much enjoyed the peppermint taste in the oxygen. It is very light and fades away pretty quickly. I felt very alert after using the peppermint taste, and just like the tasteless oxygen can, we would feel revived with just a few breaths of Boost. During a long day of hiking this is crucial. Mis-stepping due to tiredness can have a long lasting injury attached to it. So after using boost and feeling refreshed was reassuring to me. I knew I was getting assistance to help me down the mountain safely. Conclusion of this product. 5 out 5! I recommend this product for any hike. Not just ones up to summits. Hiking is a very strenuous activity and Boost Oxygen is right there to be by your side and assist you in achieving all your hiking accomplishments! So this is my second trip up to this campground. We decided to stay a little further back for a little more privacy from the trail above. This trip we hiked up in the afternoon to stay at this campground and make our way to the summit the next morning. We stayed up against the slope, opposite of the trail. We hung out in quite because there was no other campers that night. We did have a momma deer and two does in the distance. Then 30 mins later we had another deer friend that just hung around until after we took shelter in the tent. These spots are nice and already cleared. Maybe one or two rocks that needed to be moved, but it was minimal! As stated above they are sometimes hard to come by depending on weekends. High creek camp is always most popular and I have never had a problem obtaining a permit for Halfway. You can walk in to Mill Creek Ranger Station to get a permit or you can fax the office a few days in advance to submit for a permit. Came up here for the first time in August 2016. It was beautiful and breath taking. We went to hike up to stay at the summit of San Gorgonio, but the whole group was not going to complete it. So from about 10,800 ft we hiked back down to Halfway camp! When we went there was no water flow at this camp. Campfires not allowed. Thankfully we just use our jet boils and some drylite food! There seems to be about 10 spots, but really they are just unmarked flatted, cleared dirt. A few spots have logs to break it up a little. This is pack in- pack out. No bathrooms. I call this not so halfway camp because you would think that it is half way to the summit, but most definitely is not! This is about 3 miles in to the hike. Lovely little area that drops down off the trail. When you see a sign that points to high creek, basically point straight, that is when you will see right to the right a thin trail that heads down maybe 200 feet and opens up. 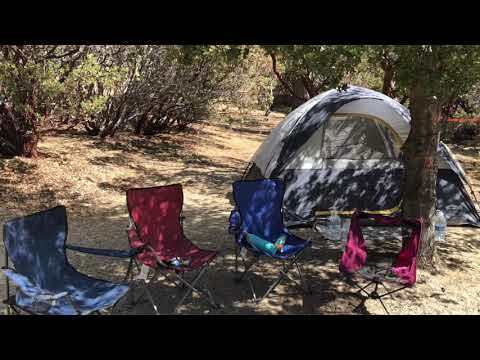 We camped in the first few flat areas, but exploring further there is many flatten out areas as I mentioned above ** This is a re-review for being mis-placed onto the "San Gorgonio Campground" That review is now deleted and placed correctly here. I grew up around in the area so I have been to this park quite a few times for a few different reasons. It is a very expansive and versatile area. There is a lake that is view able from almost every area. They have camping, horse back riding ( near by that rides through the park), disc golf course, fishing, and events. I have gone to the civil war re-enactment they hold every year. I participated in a 5K mud run. This is on top of visiting to use the disc golf course, have a picnic and go horse back riding via a close by equestrian farm. Its a beautiful park that has many different uses that can fill up your weekend. It does cost about $8-10 to enter the park per vehicle. I believe the campsite run $40-50 depending on day of week and events and this included hookups. Stayed at this campground in 2012. Mind you this was my FIRST real camping trip, I was utterly excited. The trail up to this campground is very rough. there was signs after the kilns for 4x4 only. However, we did see a little car mob up this road, like they had done it before. The road took us to just over 8,000ft elevation. Small campground, but cozy. Drop toilet close by that doesn't get serviced too often because of location. You could see telescope peak and the trail was just off the campground. Campsite had picnic table and a fire ring, thankfully. It was FREEZING when we went. Lets just say I was not prepared for how cold it was going to be. It got down to 12°F and lets just say I had just a "normal" camping sleeping bag. The view down to the valley was gorgeous. We hiked up a little ways.. maybe 3/4 a mile the telescope peak trail, then turned back. We orginally had come up to see something that was happening in the sky that late evening ( 1-2 am-ish), but by 9pm it was too cold to stay up, even with a fire going. The campground was about 80% full which was surprising since it was pretty solitary out that way. Came in the middle of the night on a colder evening so we could climb in the morning. Slept in the back of my Subie. Bathrooms smelled. Sites were pretty well set up, each had a picnic table and a fire ring that was blocked ( when we went) from the fire restrictions. For almost $30 a night, I would have expected a little more. Its a campground close to the climbing area. Nothing fancy, nothing horrible. Clean bathrooms when I visited. Enjoyed rock climbing and hiking in the area! Nice little campground, bathrooms were to be as to be expected with no camp host. aka a few spider webs; however, they did not smell and were stocked with toilet paper. Was really cold and snowy. First come first serve when we went. Bear lockers and picnic tables and fire rings! Didn't actually camp, but did run through the campground when they held a color run. Seems like a nice campground for a quick get away or just a day at the park for a family BBQ. There was one or two water features, a big field, a close by kids park. Conveniently located within walking distance of a lot of different places. Beautiful campground. Only enough parking for one car per a spot. Decent bathrooms. We stayed here so we didn't have to stay at a expensive hotel for the Spartan race championships! Love this small campground, lots of bouldering in the campground. Beautiful scenery. Some hiking too. Went up the look out tower where the woman staying there at the time was very knowledgeable and share a lot of information with us! One of the best campgrounds I've ever been to. Well maintained, clean, and just beautiful! We had a double spot and it was very spacious which is what we were looking for because we had 5 kids, 4 dogs, and 7 adults.